Le Centre pour la Promotion de la Liberté d'expression et de la Tolérance dans la région des Grands-Lacs (CPLTGL) est un organisme à but non lucratif voué à la promotion de droits à la liberté. United States Agency for International Development (USAID) in Rwanda.We created this Web site to tell you what we are doing in Rwanda and why, and to encourage your interest, support and collaboration. 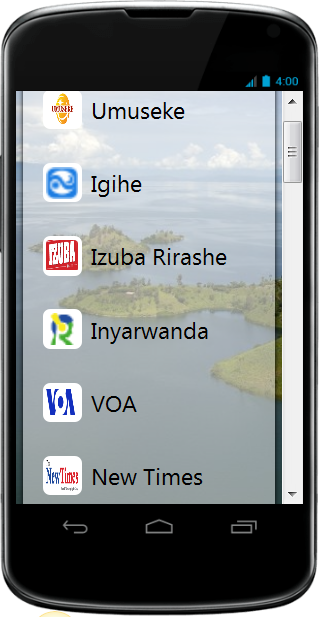 Welcome to the Department for International Development (DFID) website for Rwanda . DFID is the UK Government department responsible for promoting international development and the reduction of poverty. This is the website of the Haren-Kirambo Foundation at Haren Our aim is to increase the mutual understanding and assistance between the Hill of Kirambo, province of Cyangugu in Rwanda, and the Municipality of Haren, province of Groningen, the Netherlands.